Staff Sgt. Ryan Garrison embraces his service dog Luke at their home in Glen Burnie, Md., March 29, 2016. Garrison, who worked at the Defense Courier Station-Baltimore at Fort Meade, Md., before he medically retired, was given the Labrador to help him cope with the physical and emotional effects of his combat-related injury. Several prescriptions and mental health visits didn’t effectively assist with his emotional state. The 39-year-old defense courier then met Luke, a pitch-black Labrador. 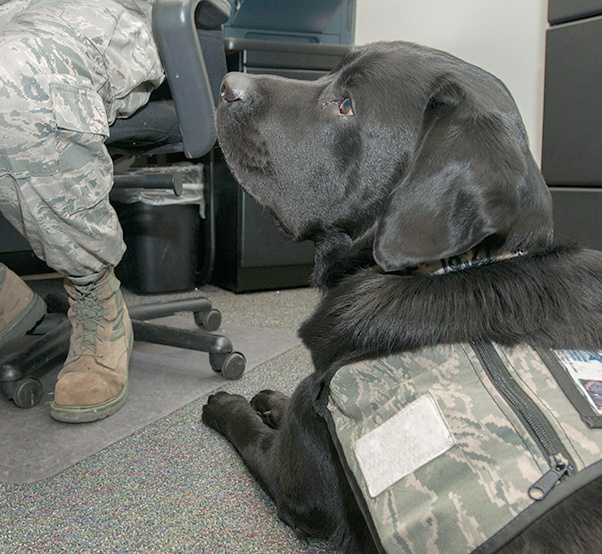 Always at his side, the skilled service dog can sense anxious feelings in Garrison and will nudge his leg with his snout to trip up the negative thoughts. With these cues, he said his panic attacks have dropped by half since he’s received Luke from Warrior Canine Connection, a nonprofit that trains dogs for wounded military members. Staff Sgt. 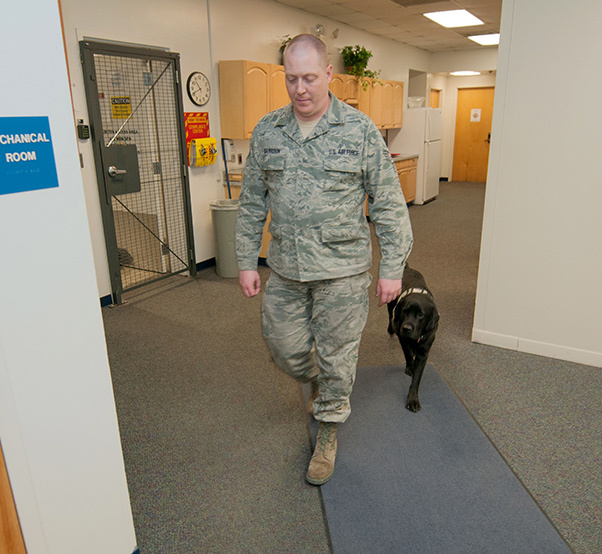 Ryan Garrison is followed around his office by Luke, a service dog he received to assist in his recovery from a combat-related injury. WCC is involved in two major studies focusing on service dogs for wounded warriors. In 2014, Congress earmarked $7 million for researchers to look at how dogs are helping military members at Walter Reed National Military Medical Center in Bethesda, Maryland. A year before that, the nonprofit teamed up with the Uniformed Services University of the Health Sciences, located next to the hospital, on a $750,000 Defense Department grant. A decade after his combat-related injury, Garrison is reaping the benefits of Luke’s intuition. The four-legged helper even wears a harness that Garrison can clutch, giving him leverage that pulls him up when the dog walks forward — a less painful way for the Airman to stand up due to a torn disc in his back. “When it flares up, I lose all feeling in my right leg. Luke helps with my mobility,” he said, noting that he rarely uses a cane now. In 2006, Garrison was hauling a shipment on a cargo loader at Kirkuk Air Base, Iraq, when an insurgent fired a rocket-propelled grenade over the fence. The RPG missed him but the nearby explosion thrust him backward, causing him to bend backward across a railing, resulting in the torn disc. The injury nagged him for years and led to sleep disturbances and mental health problems. “You try to fake it for so many years that you finally realize that you need to see somebody,” he said. 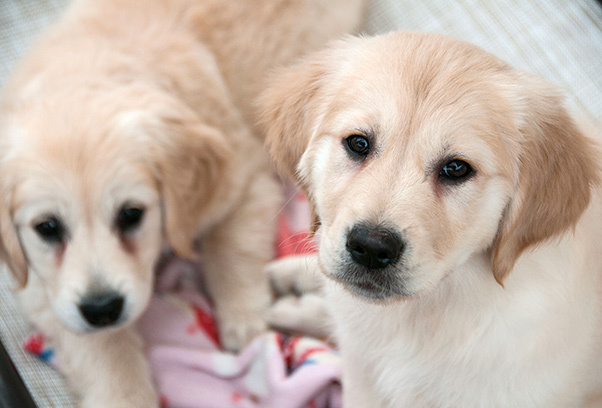 These two golden retriever puppies are some of the newest recruits for Warrior Canine Connection, a nonprofit that trains service dogs to help wounded warriors. Research has shown that dogs can help with the physical and emotional effects of traumatic injuries. He was prescribed medications that initially soothed symptoms, but the side effects produced even more. For some veterans, service dogs can provide a path to easing drug dependency for mental illnesses, said retired Maj. Gen. Kevin Pottinger. Many service dog groups across the country are gaining popularity as more veterans seek treatment, he said. Dealing with two recent wars, the Department of Veterans Affairs has seen disability recipient numbers grow from 2.3 to 3.7 million between 2000 and 2013. A steady stream of disabled vets will likely continue, as the post-9/11 veteran population is set to climb by more than 50 percent from 2013-2018, according to VA’s latest data. “We have so many veterans with traumatic brain injury or post-traumatic stress disorder that they just can’t provide enough dogs to take care of all our vets,” Pottinger said of service dog groups. It can take up to two years before a dog is permanently placed with a veteran, he added. Garrison heard of the natural healing approach when his wife, Julie, a music therapist, saw the service dogs at Walter Reed. She convinced him to look into it. Rick Yount, the executive director of Warrior Canine Connection, trains a young golden retriever at one of the group’s sites in Brookville, Md., March 11, 2016. Wounded warriors also help instruct dogs in specialized skills for two years before they are permanently placed to help with another wounded warrior’s daily living. Golden and Labrador retriever puppies embark on a two-year regimen by the WCC to learn how to assist veterans when needed. During that time, the dogs are trained by wounded warriors and are taken to medical centers to interact with others. Over the training period, the nonprofit estimates that one dog will reach at least 60 wounded warriors. While attending therapy sessions at Walter Reed, the dogs caught the attention of retired Master Sgt. Jesse Graham, who suffered a broken neck during a snowboarding accident. The wheelchair-bound Graham went on to help train a dog, and last year was given Stanley, another black Labrador. A high-functioning quadriplegic, Graham stays active in several sports and competes in the Warrior and Invictus Games. But Stanley stays close by to assist with the small stuff. He flicks on light switches, opens doors, fetches shoes, and can be used as a brace. “He can literally pick up a dime with his mouth, not swallow it and drop it in your hand,” he said. Liz Worthington, a Warrior Canine Connection volunteer, spends time with two golden retriever puppies at one of the nonprofit’s sites in Brookville, Md., March 11, 2016. Before puppies embark on a two-year training program, they get plenty of human interaction so they can be a friendly service dog for wounded warriors. As playful creatures, dogs can even get reclusive PTSD sufferers, like Garrison, to open up. Service dogs may help ease the symptoms of some ailments, but experts recommend that a dog be used to supplement other treatments. Still, Yount said it’s hard to ignore the chemistry between these dogs and wounded warriors. But there are at least two side effects: drool and fur. Editor’s note: November is Warrior Care Month, a time for the military community to reaffirm its commitment to the recovery and reintegration of the nation’s wounded, ill and injured service members. Luke, a service dog, lies at the feet of Staff Sgt. Ryan Garrison as he completes work at the Defense Courier Station-Baltimore on Fort Meade, Md., March 29, 2016. Luke goes everywhere with Garrison to assist in the Airman’s recovery from a combat-related injury. 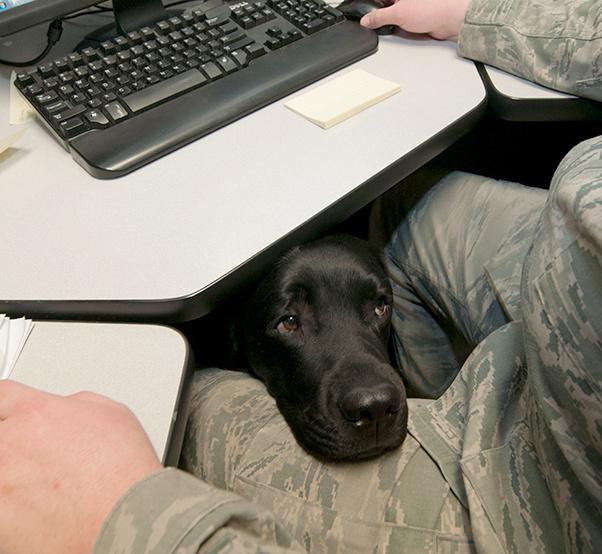 Luke, a service dog, rests his head on the lap of Staff Sgt. 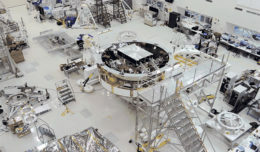 Ryan Garrison.